Win this app November 8th, 2015! Alphamonster might be Marbotics’ best app yet. I have had the privilege to review 3 of their apps so far and this one seemed to offer the most opportunity for learning. It is jam packed with 5 comprehensive learning activities. The animated letters, colorful sound effects, and the ability to pair it with the Smart Letters toy is fantastic. This app is best suited for children between the ages of 3-5 years of age. 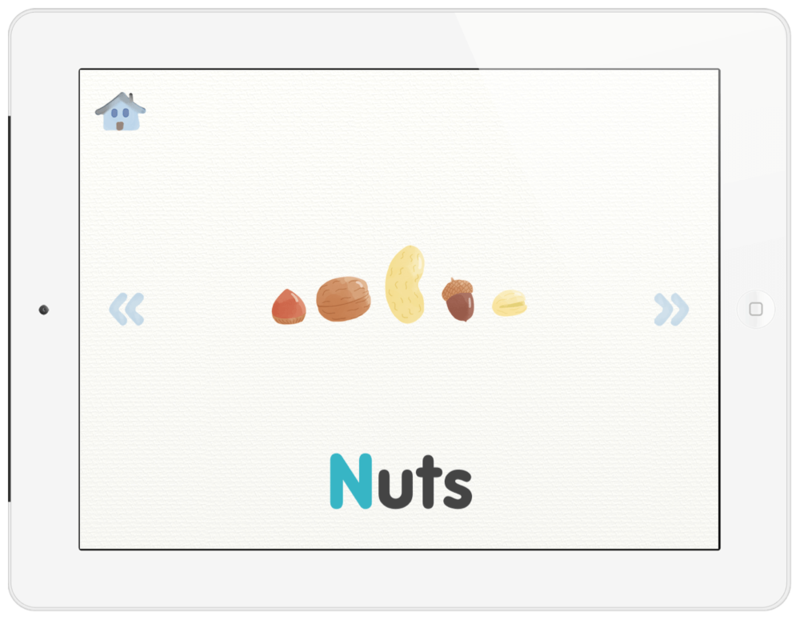 Children with learning delays, Autism, or other impairments may also benefit from this app. The child can feed the letters, sounds, and pictures into the monstromachine. They will then be able to practice identifying both uppercase and lowercase letters, their sounds, names, and the accompanying pictures that apply. Alphamonster was created by Marbotic. It is a french company that believes in innovative learning practices and hands on technology. Currently, they have 5 learning apps available for purchase in the app store. They also sell the Smart Letters and Smart Numbers toy which helps children integrate toys with technology. The features in this app will grab the attention of parents and kids right away. One thing to note is that it is only available on the iPad. You will not be able to download this app onto an iPhone. This is a little disappointing because many children don’t have access to both. When you open the app, It is not hard to see from a first glance why this app is so cool. The colors are vibrant, the navigation is so easy, and the sound effects are whimsical. What is really great about this app is that as you explore more, you will find even more magic. Everything from the settings menu options, to the parent controls, and even the diverse learning activities make it great. Here are some of many features included in the Alphamonster app. This app offers 4 different languages: english, french, german, and spanish. This is perfect for children who speak multiple languages, are in a bilingual program at their school, or for schools with a diverse group of children and cultures. Apps without parent controls are like having a car without a car seat. They are so important! I am happy to say Marbotic has parent controls set up on their settings menu. There are also no in-app advertisements or links outside of the app except in that parents menu. It is safe, simple, and not distracting. One of my favorite features in this app are the graphics. The colors captivate you. Touching the images, letters, and illustrations makes them come to life and do really interesting and funny things. My kids last a lot longer in an app when it has features like this. Marbotic has done a great job at making the entire app exciting and full of great ways to learn. You also hear the letters of the sounds as you touch on them and are able to identify more words. The settings menu on the top right corner of the main menu will enable you to customize the learning for your child. Some of the great options available include: choosing from lowercase or uppercase letters in the drawer, choosing print or cursive, hearing silly sounds with the letters or turning those sounds off, and seeing the illustrations that go with the letter or not at all. Many children get distracted easily and so being able to adjust that for each kid is a huge help. This app can be paired with the Smart Letters Toy to give it an even more hands on and magical experience. 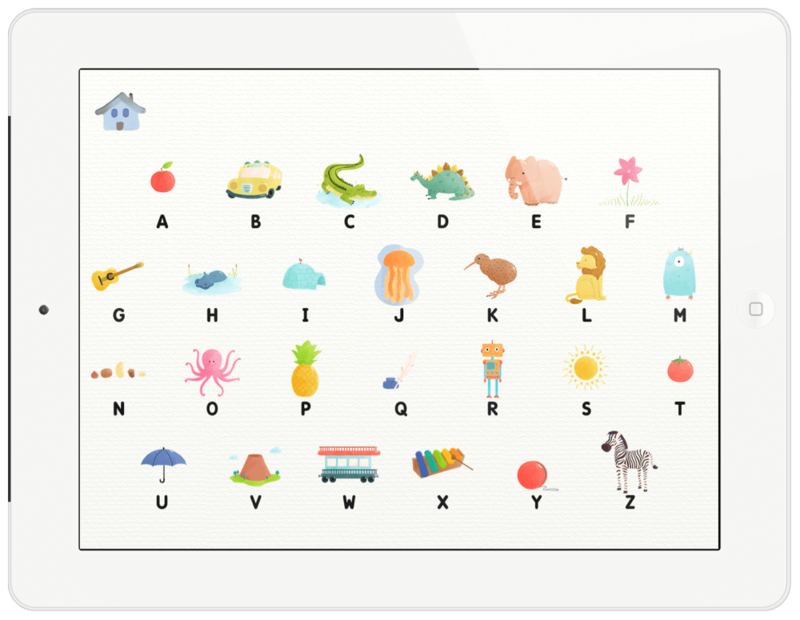 The child will be able to set the wooden peg letters onto the screen and the app will immediately identify them. They are not battery powered and so you don’t have to worry about switching out batteries. This is one of the coolest toys I have seen. My kids use the Smart Number Toy all the time with Marbotics’ other apps and so I can attest to the genius of this technology. It really helps children transfer what they are learning on the iPad to real life with a tangible item. 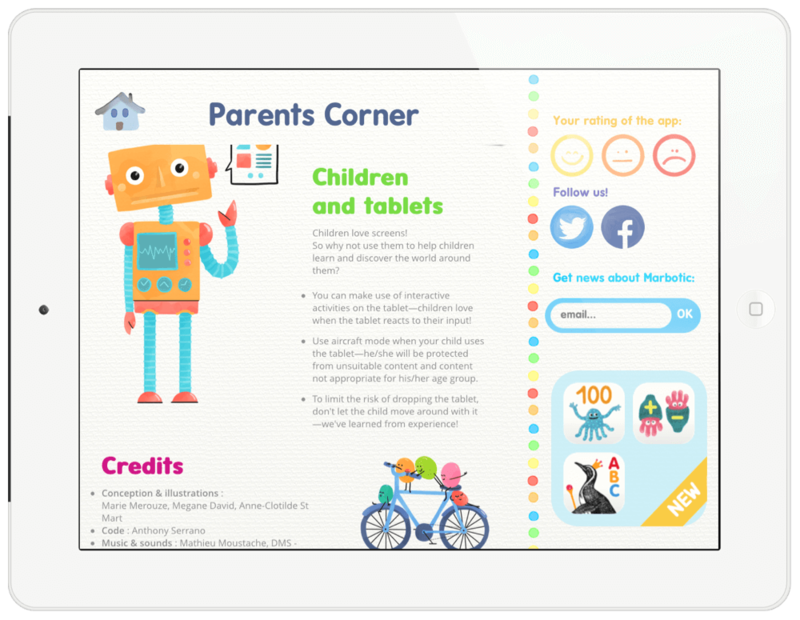 The Parents corner gives more information about the app, allows the user to contact Marbotic and join their social media networks. It also tells a little more about the Smart letter and number toys available for purchase. What can I say? I was impressed with this app. 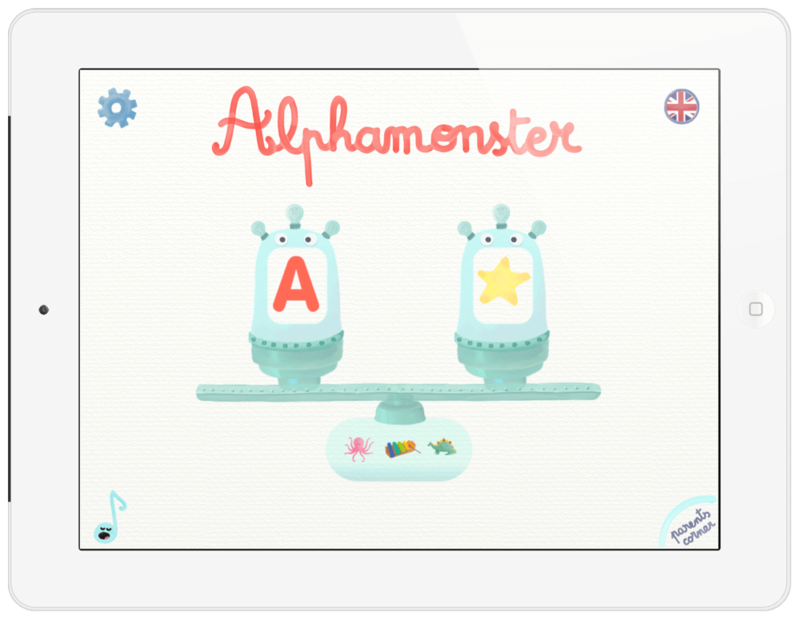 Alphamonster is perfect for children that are working on letters, and sounds. I would agree that it is best suited for kids under the age of 6 but could still help those that haven’t identified certain letters and sounds. The customized settings menu, beautiful illustrations, and comprehensive activities that can last a while to get through were my favorite. A few small improvements I would make include: having it available on the iPhone, and having the data or learning progress somehow trackable so it can be more useful for teachers and parents. Beyond that, I am one happy Alphamonster momma. I would easily purchase this for my kids and I know they would get a lot of use out of it. Be sure to enter the giveaway on the Touch Autism Facebook page and purchase Alphamonster today! At the time of writing this review, Alphamonster retailed for $2.99 in the app store. To learn more check out the Marbotic website, a company that believes in hands on learning, innovative design, and having fun while learning! Alphamonster invites children to feed the letters, sounds, and words into the monstromachine. Practice identifying letters, their sounds, names, and the accompanying pictures that apply.